Calling all bikers! Raw Thrills presents Super Bikes in Hi-Def! 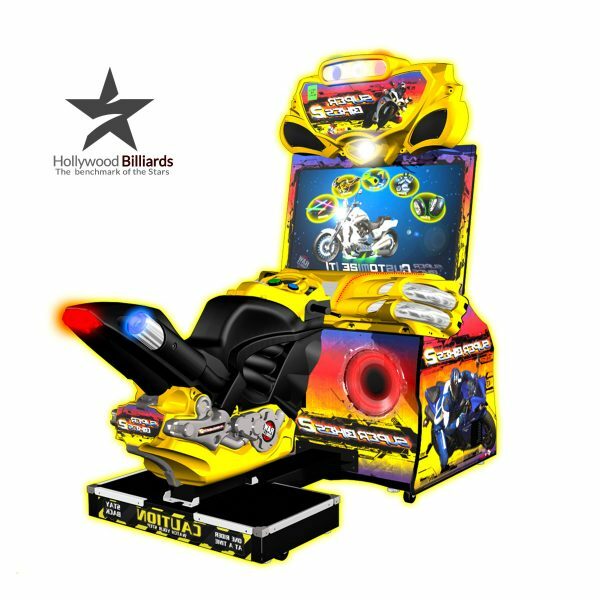 With a 42-inch LCD monitor, 10 never-before seen tracks, all new light show, and tons of electrifying effects, the Super Bikes 2 will blow your mind. Race through Moab as fighter jets attack UFOs; descend into the haunted catacombs of Paris; dodge giant worms in hyperspace; escape elephants in the jungles of Thailand; jump through the flaming hoops of Las Vegas; run with the bulls in Spain; and cruise through the unbelievable snow-covered mountaintops of the Himalayas. You can choose from 9 riders and 12 bikes with multiple tricked-out upgrades for engines, decals, tires and more! The game is built on a highly reliable system featuring RIO and Dell computers. Please be sure to measure the space available for this game. Total space needed: 78 1/2”H x 45 1/4”W x 86”D. Game ships in 2 boxes: Main Cabinet: 84”H x 35”W x 48”D; Bike Pedestal: 48”H x 38”W x 69”D. Total weight: 657 pounds.